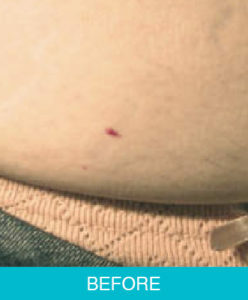 Cherry Angiomas are also known as ruby points. Larger Angiomas are also referred to as Campbell spots. They are the most common vascular lesion; they consist of highly concentrated dilated capillaries and can be flat to the skin or larger and slightly raised (Campbell spot). Therefore their appearance is a cherry red to purplish colour. Cherry Angiomas usually appear as we age and typically start out as a small red dot although they can grow up to a few centimetres in diameter. They are very common and can be found on most areas of the body but are most common on the torso. 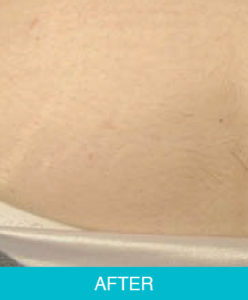 These skin anomalies are usually found on fairer skinned people and as a family trait. 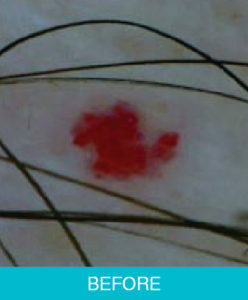 Most of the cherry angiomas can be treated with one treatment with the exception of larger or deeper coloured lesions which may take a few treatments. If a follow up treatment is necessary you will still notice improvement after one treatment, the red spot will lighten in colour to a pinkish colour. The technician will insert a probe into the anomaly while releasing the current. The smaller anomaly will dry up and disappear. 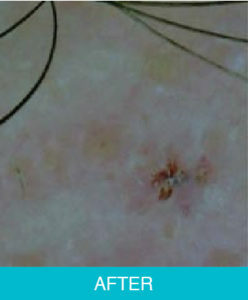 The large anomalies, Campbell spots, will result in a scab until the skin has repaired underneath, then fall off on its own. The procedure is quite quick and many can be treated during one treatment session. Some larger cherry angiomas may need more than two treatments. Do not scratch the area and keep the area dry. A scab will form and heal within a few weeks. If the anomaly hasn’t disappeared completely a follow up treatment can be performed after three weeks.